To finalize global lake observability results and study global reservoir observability. To model uncertainty in SWOT lake mapping. To investigate lake compositing methods in cycle-based lake product generation. High-quality continental-scale digital elevation models (DEMs) are essential in global lake observability analysis. Continental DEMs used in Year 1 were produced by compiling 1- arcsecond SRTM DEMs (as the primary data source), Canadian DEMs, European DEMs, and ASTER DEMs. However, the ASTER DEMs are rather noisy and induce unrealistic layovers. Northern Russia (north to 60°N) is the only region using the low-quality ASTER DEMs and is the main area for improvement in Year2. 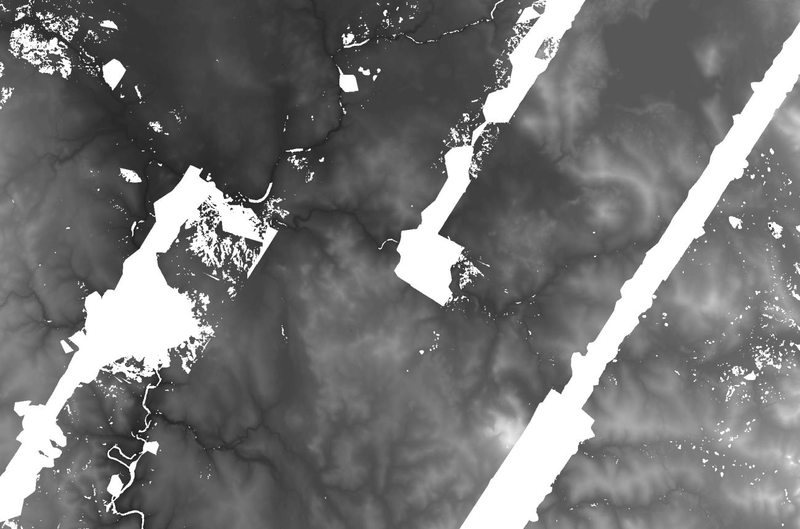 The Russian DEM shown in Figure 2 show that the ASTER DEM north of 60°N appears much noisier than the SRTM DEM in the south, and induce extensive but unreal layovers in the north. In addition, the ASTER DEM also contains erroneous values in the river, which lead to artificial layovers into adjacent areas. We plan to compile a new DEM for Northern Russia using recently available DEM sources such as Arctic DEMs. 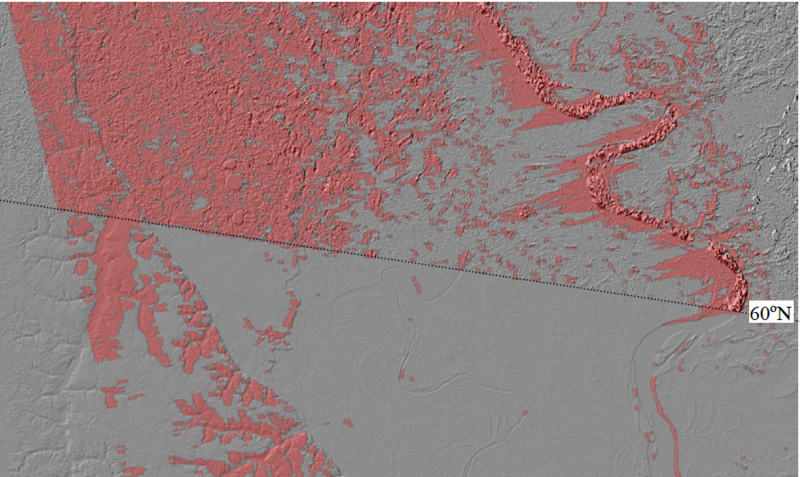 Arctic DEMs are a 5m-resolution surface model of the Arctic using optical stereo imagery, with an intention to cover 60°N and north. As Figure 2 shows, however, the DEMs are full of gaps. Procedures of filling small gaps and patching large ones are essential, and will need assistance from other DEM sources. Once the Northern Russian DEM is updated, we will re-run layover simulation for Europe and Asia continents, and finalize the global lake observability results for publication. Figure 1. Russian DEM along 60°N and simulated layovers (red). Figure 2. Arctic DEM around (103°E, 69°N) in Northern Russia, full of gaps (white). Reservoirs are storage of water resources directly accessible to human, thus of great interest to the SWOT mission. Many of large ones are surrounded by mountains and their SWOT observability is rather susceptible to layover effect. We plan to identify reservoirs from our lake database and other reservoir/dam databases, and to provide a quantitative assessment on global reservoir observability from SWOT. The impacts of layover effects are highly variable on lake area mapping and water level derivation. On top of the current layover mapping, we hope to add a layover intensity measure and relate it to uncertainty induced by layover effects on lake area and water height measurements. This is to be a collaboration with Curtis Chen's group at JPL. Finally, we plan to migrate our SOWT layover simulation tool that was developed in Year 1 from space-borne SWOT to AirSWOT datasets with two purposes: 1) to validate layover simulation using real datasets, and 2) to help the AirSWOT teams in identifying layover areas from acquired images. The AirSWOT case studies will help to understand the appearance of layovers on real KaRIn images, and link the layover intensity measure to uncertainty in lake measurements. We in Year 2 will begin to explore model-based algorithms for lake mapping from simulated SWOT datasets. An accuracy assessment is always desirable in water body mapping. The error in the inundated area of mapped water bodies from KaRIn includes both the mapping error and the uncertainty due to the edge effects around their shores. The mapping error is defined based on distinguishability between water and land in image segmentation. Histogram analysis allows us to estimate the range of underestimation and overestimation using the Gaussian functions fitted for the water and the land modes. The edge effect uncertainty can be modeled from water body boundary characteristics using the size and shape of the water body and the imaging resolution of KaRIn. Figure 3 quantifies the uncertainty of each lake delineated from the simulated KaRIn image. The uncertainty also shows a strong dependence on the look angle. As expected, lakes in the middle ranges (green) are mapped with low uncertainty (~5%). From the center to the near and the far ranges, the uncertainty rises (from green to red), reaches ~20% at 0.9o and 3.7o at the near and far ranges respectively, and goes beyond the 20% limit at the very near and far ranges. This is the error budget for a marginal size lake (250x250 m2) for SWOT, but the mapping accuracy is expected to be higher for SWOT's larger water bodies, which SWOT is designed to capture. We plan to analyze the relationship between uncertainty and lake size, lake shape as well as look angle. Figure 3. Uncertainty assessment for individual lakes from a simulated SWOT dataset. The estimated uncertainty increases from the middle ranges (green) to the near and far ranges (red). As lakes are dynamic and sometimes intermittent, size discrepancy of the same lake is expected in swaths acquired on different dates. In addition, the same lake may be mapped differently using different mapping algorithms. In addition, marginal overlaps exist between SWOT swaths; water bodies across or overriding swath edges are mapped incomplete or disconnected. As a consequence, lake features in a direct composite of pass-based lake products are commonly found in complex topological patterns such as merging, nesting, and overtopping. This presents a technical challenge when we composite pass-based lake products into cycle-base products, and even into seasonal or annual products. SWOT cycle-based lake product should present the averaged condition of a lake within one 21-day cycle when multiple observations are available. The current plan in the ADT team is to use the maximum lake extent to represent the lake's shape in the cycle-based lake product. However, the maximum extent is not representative to the lake's average condition and is also susceptive to the mapping error. We plan to develop a new lake compositing method for the SWOT mission using the intermediate sized lake extent, which is expected to be more representative to the averaged lake shape. Figure 4 illustrates the schematic logic flow of the proposed lake composition plan. Lake features mapped from all individual swaths (Fig. 4a) are first merged and superimposed to form a raw composite layer (exemplified in Fig. 4b where lakes are merged from four source SWOT swaths; each scene denoted by one distinct color). 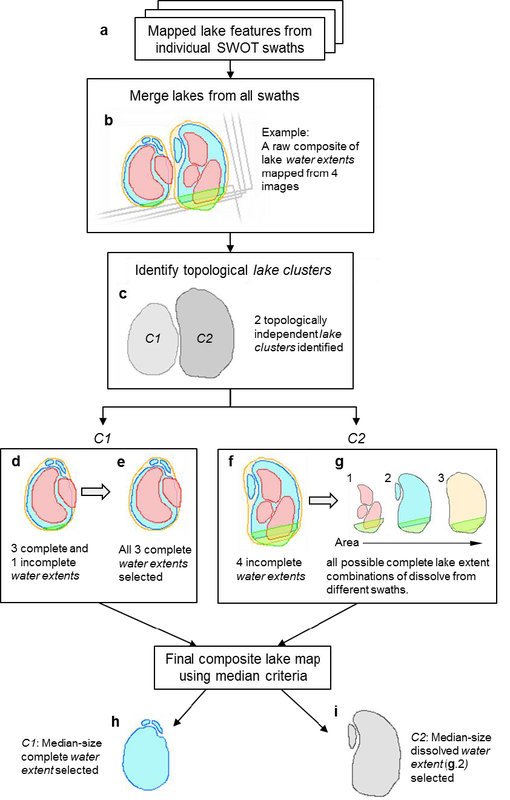 In this raw composite, the original lake individuals remain unaltered in location and geometry, but are grouped into numerous clusters based on spatial concurrence. Here a lake cluster is defined as a hypothetical entity representing the maximal inundation extent dissolved by overlapped lake features mapped from multiple swaths, and is topologically independent from any other clusters (Fig. 4c, two clusters C1 and C2 grouped from Fig. 4b). Each cluster is a unique spatial unit where the representative, median- sized lake extent could be subsequently identified from overlapped lake features. Figure 4. Schematic illustration of lake composition in cycle-based lake product generation. We use the examples of C1 and C2 to further illustrate two typical situations where the existence of incomplete water extents complicates the lake composition procedure. A water extent is considered to be complete if it does not touch the swath edge. In cluster C1, one incomplete water extent (the green feature in Fig. 4d) concurs with three complete extents, and is considered as an invalid lake extent and excluded in the selection process (Fig. 4e). In case of a lake overrides adjacent swaths, none of the images can map out the lake completely alone. As illustrated in cluster C2, all four water extents mapped from the swaths are incomplete (Figure 4f); under this circumstance, different combinations of incomplete water extents are dissolved across tiles to form a series of complete lake entities (Figure 4g with 3 possible dissolve combinations). In either cluster, the median-size water extent was then used as the output in the final composite lake map (Figure 4h for C1 and Figure 4i for C2). The compositing scheme produces the cycle-based lake product using median selection in the vector domain. The method can not only reduce the impacts of seasonality and inter-annual variability, but also are robust to mapping error and mitigate over-estimated (including commissions) and under-estimated (including omissions) lake mapping. As such, the produced cycle-based lake maps are reliable and representative of the mapping episode (i.e., a 21-day cycle). This proposed compositing plan is potentially applicable to generate seasonal and even annual lake products. A comparison between the currently used maximum lake polygon and the new median-sized polygon will be provided. Global layover product. The global layover products will be organized into continents. A polygon layover layer is produced for each SWOT pass over the continent. Global lake and reservoir observability analysis report.